KABUL, Afghanistan — Senior Taliban leaders said Tuesday that women would not be part of their delegation at upcoming talks with U.S. officials and Afghan representatives, contradicting an earlier report that they would be included for the first time. 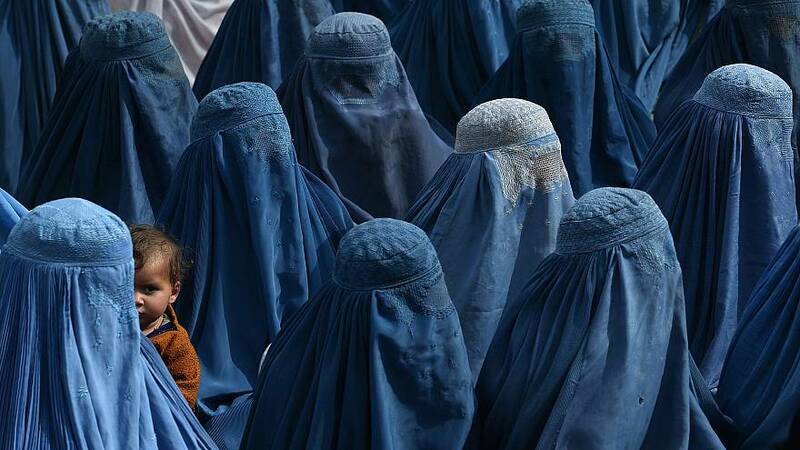 On Monday, Reuters cited the movement's spokesman, Zabihullah Mujahid, as saying women would be involved. The Taliban hold extremely conservative views on the place of women in society so the statement surprised many observers, and was seen as a sign the group had moderated its views. Mujahid later claimed his comments had been "misconstrued" and ruled out the possibility of including women in the Taliban group at the meeting scheduled for April 19 in Doha, Qatar — the latest in a series of talks between Taliban and U.S. officials that is expected to include an Afghan delegation. These contradictory messages come after months of the Taliban giving little ground in talks with the U.S.
Two senior Taliban leaders also ruled out the participation of women in their delegation. "We still have a clear-cut policy that we wouldn't allow women to represent us any in capacity or work publicly when we come into power," one Afghanistan-based commander told NBC News. Both spoke on condition of anonymity. While still a deeply conservative country, Afghanistan has seen some improvements in the lives of women and girls since a U.S-led invasion in 2001 overthrew a Taliban government. Afghan women and international observers fear a re-empowered Taliban would strip away hard-won rights. Ahmed Mengli reported from Kabul, Mushtaq Yusufzai from Peshawar, Pakistan, and F. Brinley Bruton from London.